I have little obsession with mascaras and I cant keep my hands off when I find a New one. 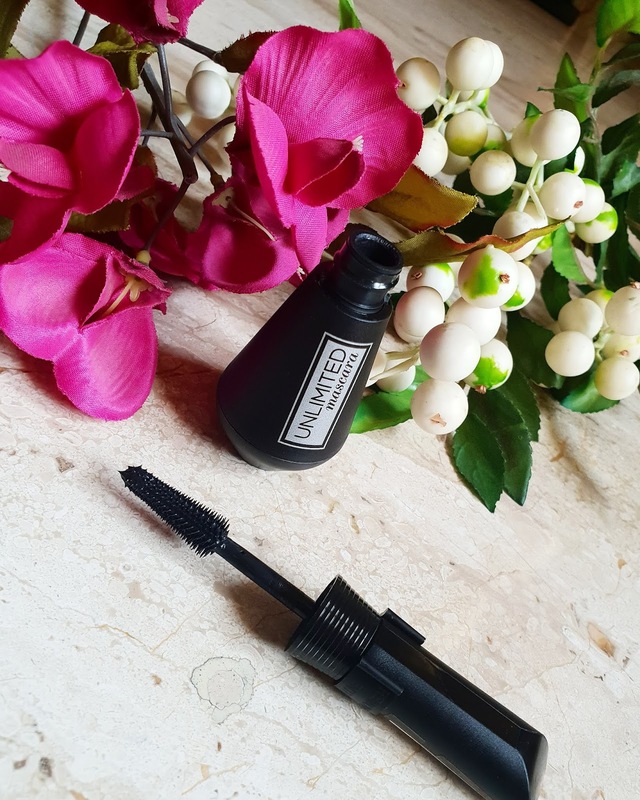 Here I am with a New game changing mascara UNLIMITED by L’Oreal Paris. You don't have limits then why should your lashes have? Unlimited mascara pushes the lashes to its limit. So the packaging is bit different it comes in a matte black bulky tube with dual positioned wand. 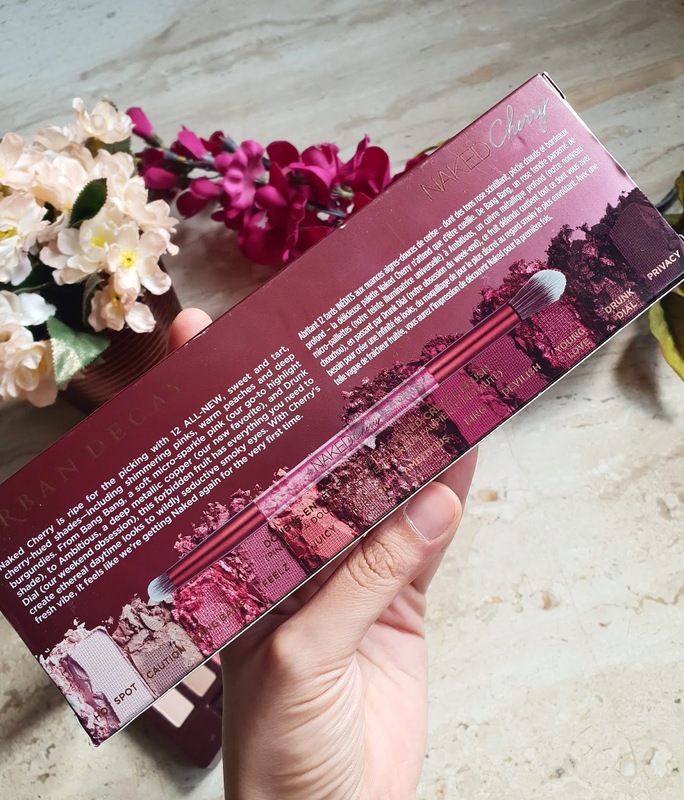 The packaging is not a travel friendly but it can be used as regular mascara and as well as in other position for outer and inner lashes. 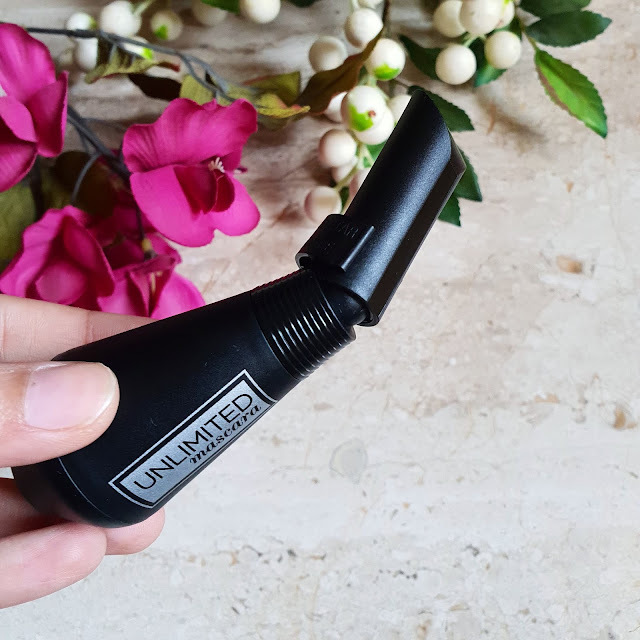 Now this applicator is so flexible you can actually apply on both upper and lower lashes without any hassel. The brush also bends in 2 angels for precise application. These mascara is basically for volume and length it helps to coat each and every single lash. It’s a water resistant mascara which lasts for all day long. It comes in a intense black shade. The formula is creamy and on multiple swipes it doesn’t give a clumpy look. It doesn’t flake nor does it make my lashes hard. 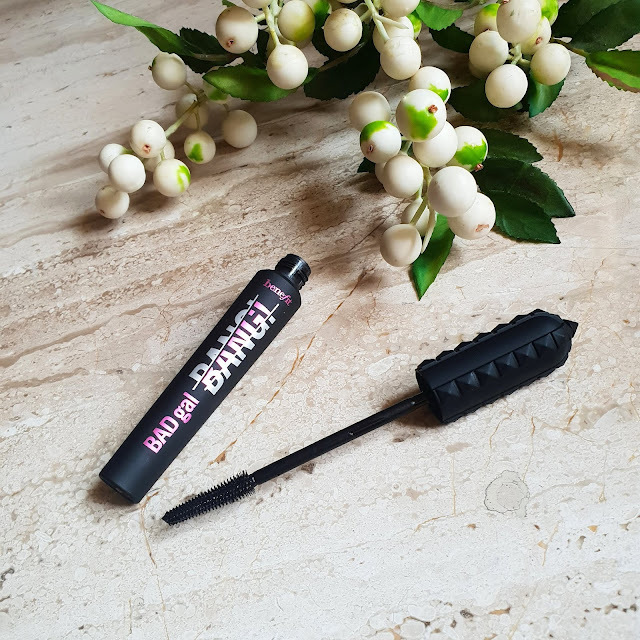 The brush is tapering on tip which makes it easy to apply on outer and inner corner of lashes. It’s a very good mascara for everyday use and totally worth the money. The formula contains latex polymer which helps to stretch the lashes making it longer and thicker. The formula is light weight and doesn't weigh down the lashes. It keeps them curled and in position for long hrs. I am pretty impressed with this mascara. There is no smudging OR any transfer of mascara. 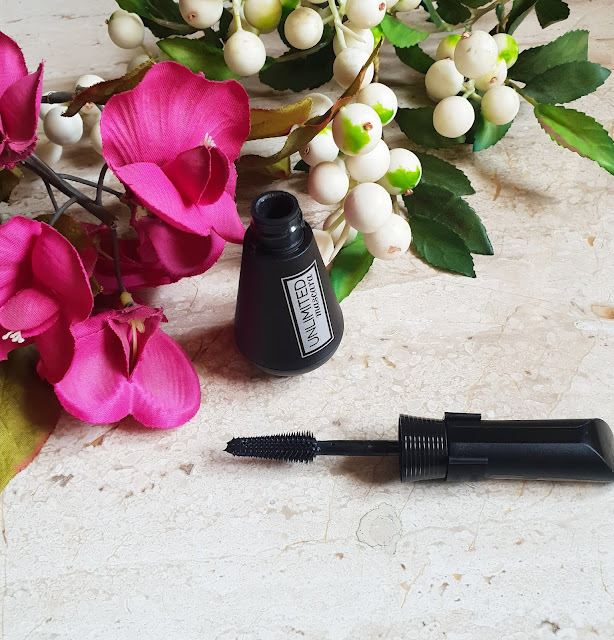 Overall recommended it may not help to deliver a false dramatic lashes but definitely adds to volume and length of your natural lash. If you are obsessed with mascaras this should be in your wish list. I overall love L’Oreal mascaras they do not disappoint me. And the unlimited one due to its brush and wand it stays above all. GET UNLIMITED LASH IMPACT FROM EVERY ANGLE. What’s your take on dual positioned mascara? BENEFIT BADGAL BANG! MASCARA is it good? 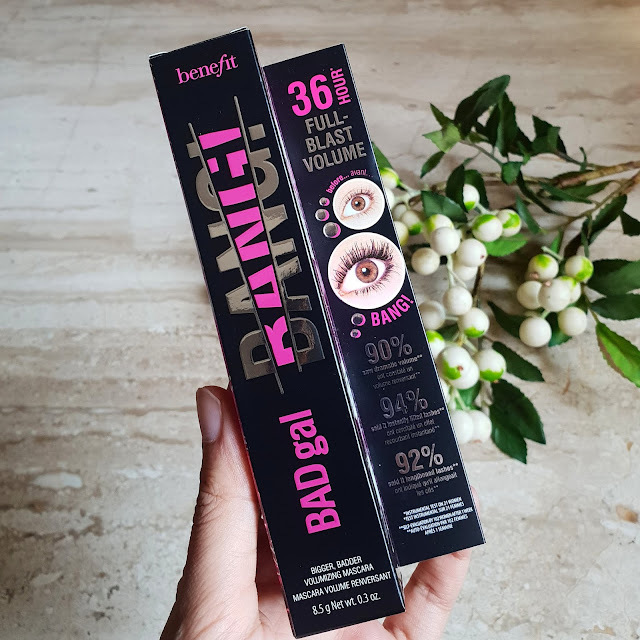 If you are obsessed with Mascaras like I do you definitely must have tried BADGAL BANG from Benefit. I almost love all of the mascara which benefit comes up with. And this was being recently launched. While visiting Sephora I was completely unaware of BENEFIT MASCARA. Before getting it I didn’t even heard any reviews about it. I was pretty confident about this mascara as it gets bigger and badder. 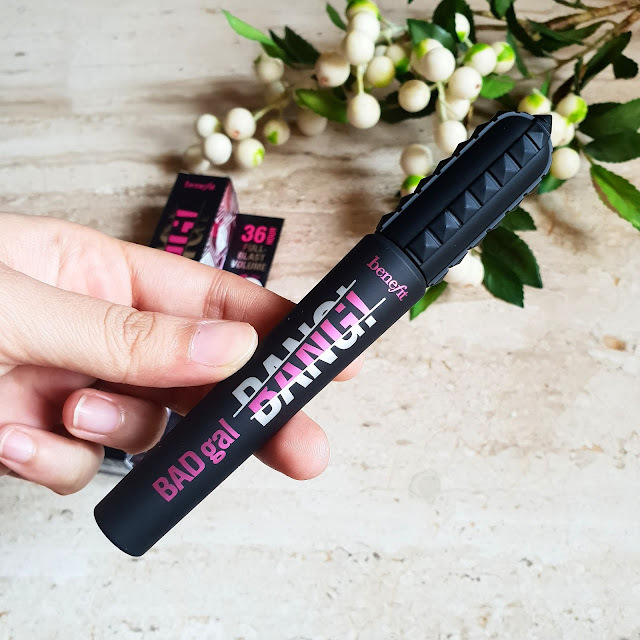 So this BADGAL BANG mascara comes in a very attractive packaging. It comes in matte black and hot pink tube which feels like made of rubber. The outer cardboard packaging also comes in black and pink which looks cute and interesting. The packaging is very sturdy and Wand has less spikey bristles. The SLIMPACT BRUSH helps from root to tip corner to corner application. Its quite flexible and so you may not have complete control over the application. It’s a non waterproof mascara but lasts for whole day. It gives length and volume both to my lashes. Also I like using it on my lower lashes. 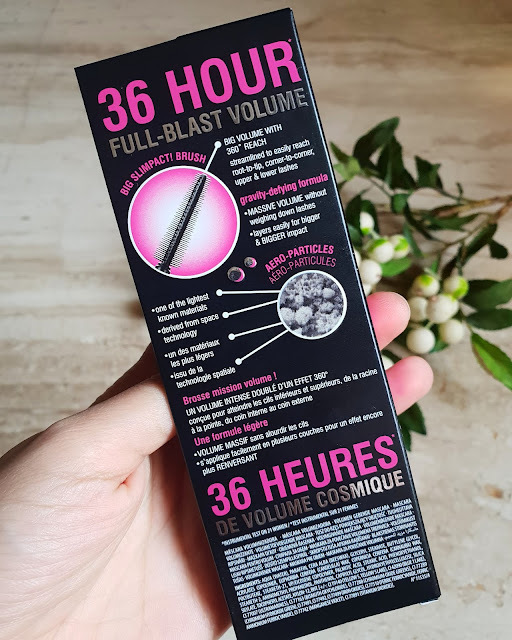 These mascara claims to last for 36hrs which can be totally true. It has zero flaking and gives total drama to your lashes. I am happy to use this mascara they are bit difficult to remove but with oil base makeup remover they come off easily. Also it makes my lashes stiff and needs multiple application for desired effect. 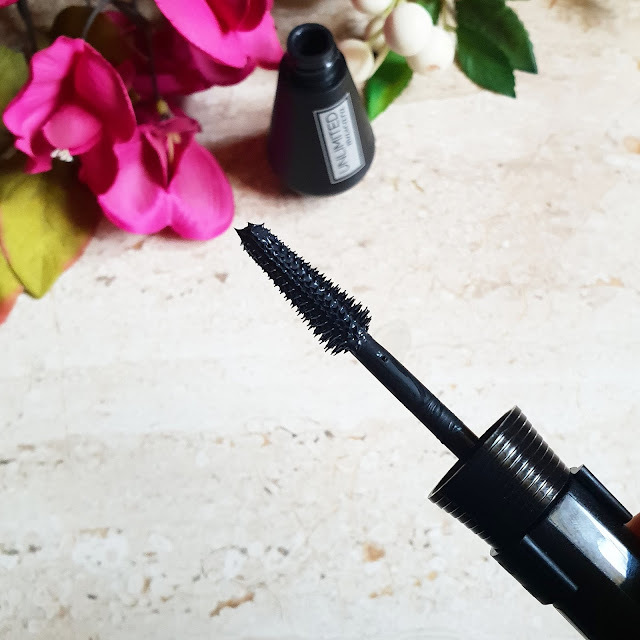 This mascara instantly lifts my lashes for bigger voluminous lashes. It contains aero particle which comes from space technology it gives impact without weighing down the lashes. Also it has Pro vitamin b5 which thickens and strengthen lashes. Even after layering it doesn’t give any clumpy look the brush helps to coat each and every single lash. 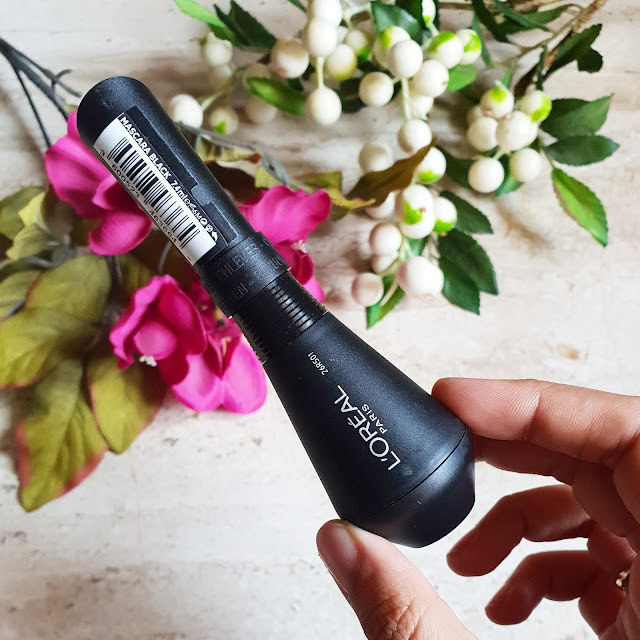 Overall loved it if you love using mascara which adds volume and length to your lashes this is a great option for you all. I always prefer non waterproof mascara over waterproof ones so they are easy to remove. But as bad gal is water resistant and smudge proof it gets difficult to remove on the end of the day. 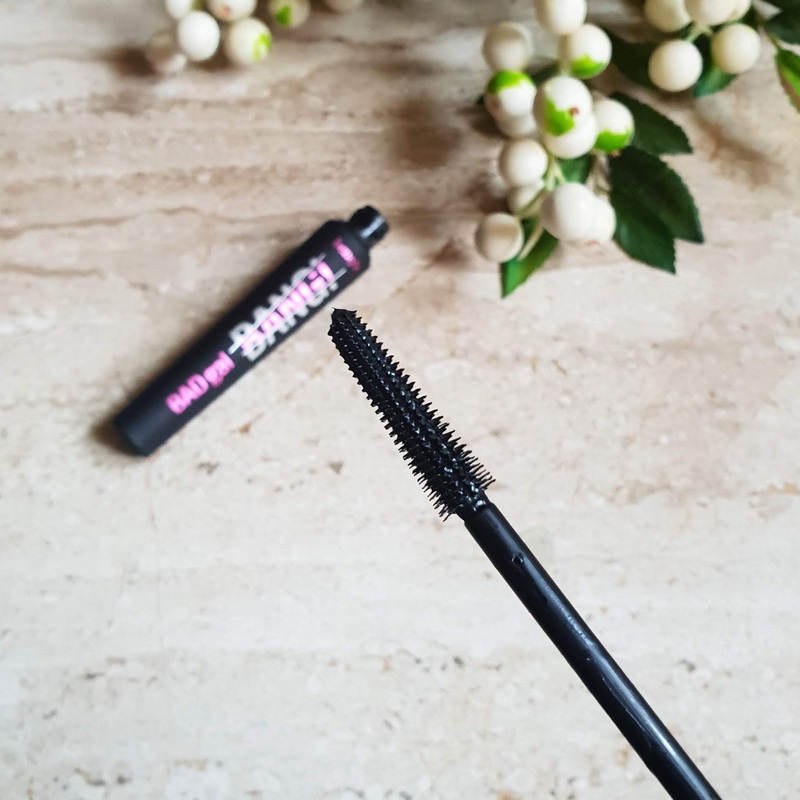 My lashes don't have much length but thanks to this mascara it keeps my lashes curled and voluminous for full day. TIP-The more you layer the more it gives volume. 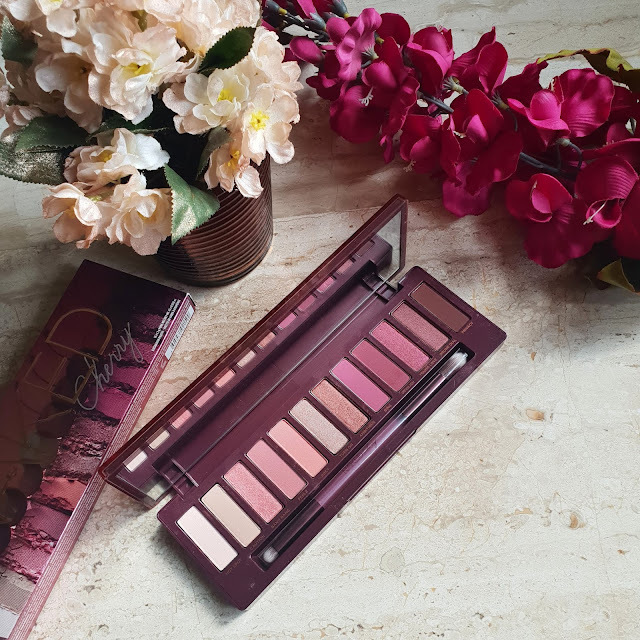 NEW URBAN DECAY NAKED CHERRY PALETTE IS IT WORTH? After a long time I am back with my routine. If you follow me on Instagram I had a small visit to Paris and I couldn’t resist myself from going to Sephora at Champ Elyeses. Also I got to see NATASHA DENONA which was totally exciting. Also it was my birthday so I wanted to give a treat to myself by getting some new makeup products. 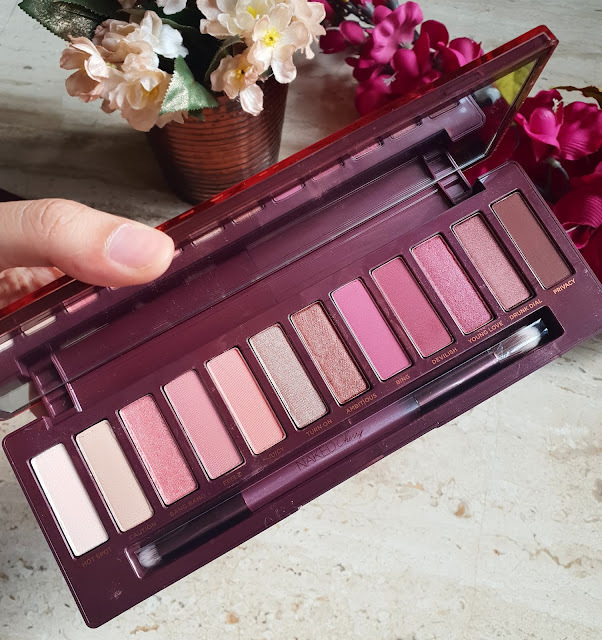 The first thing I would like to review is Urban decay Naked Cherry Palette a perfect eyeshadows palette for fall/ autumn 2018. 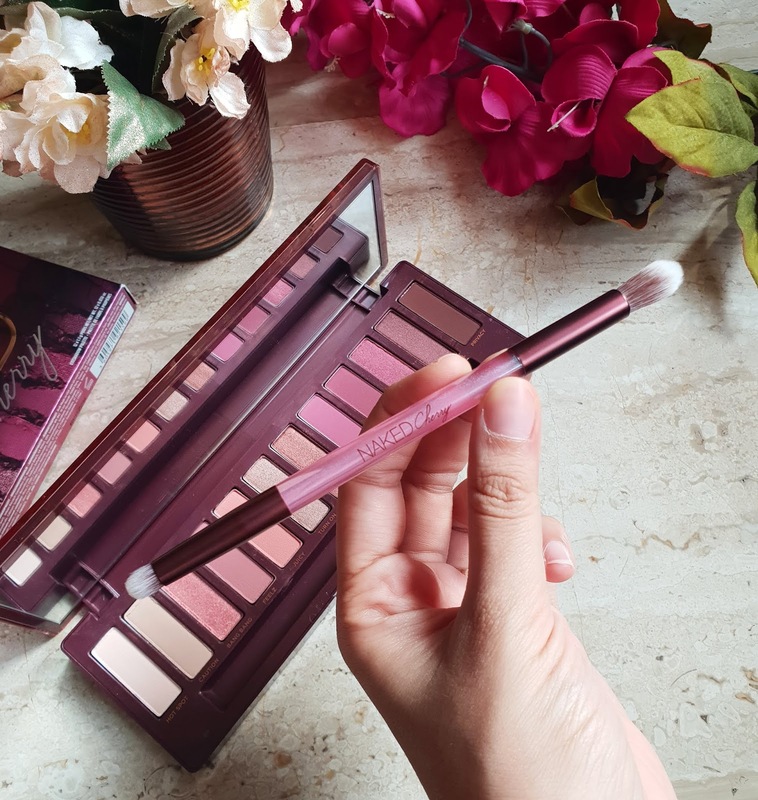 This eyeshadow comes in a classic sturdy plum packaging with a two sided brush and mirror on one side. The eyeshades are mixture of coral and plums. 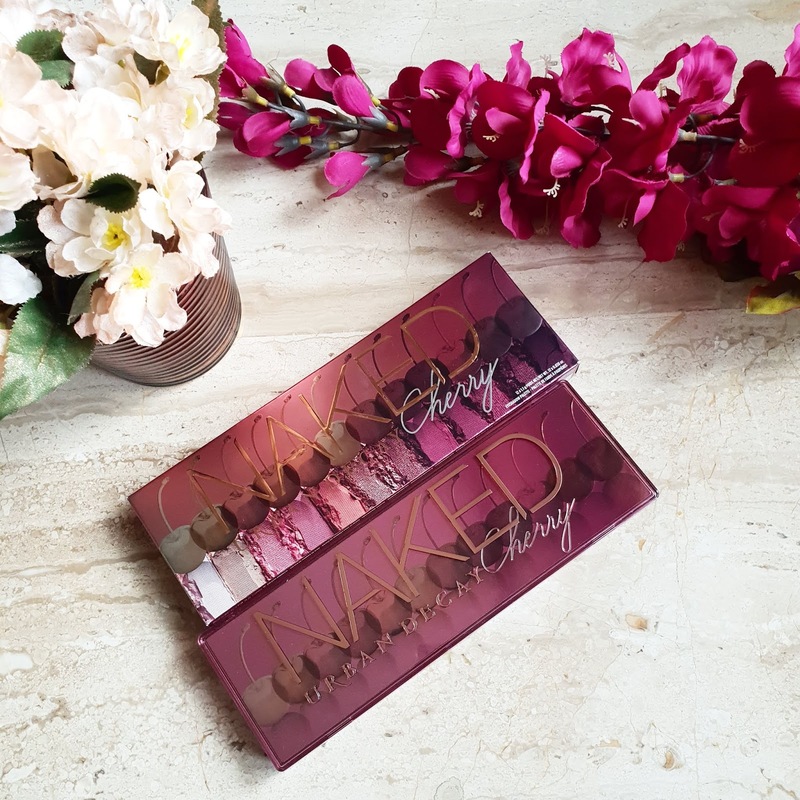 Compared to previous naked eyeshadow palette I found some of the shades dry powdery and less pigmented. It has shimmer and matte eyeshadows both and the texture is not so soft also the shimmer ones were less shimmery and were difficult to build. Though some of the shades came out very well. There were fall outs with the matte eyeshadow. 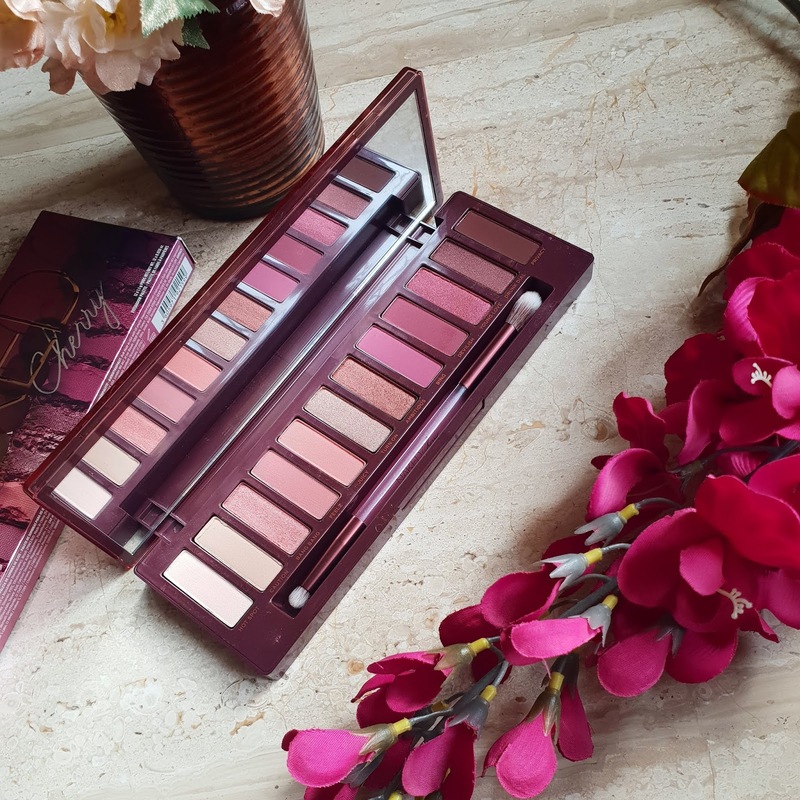 The quality and pigmentation was not up to the mark and left me little disappointed. 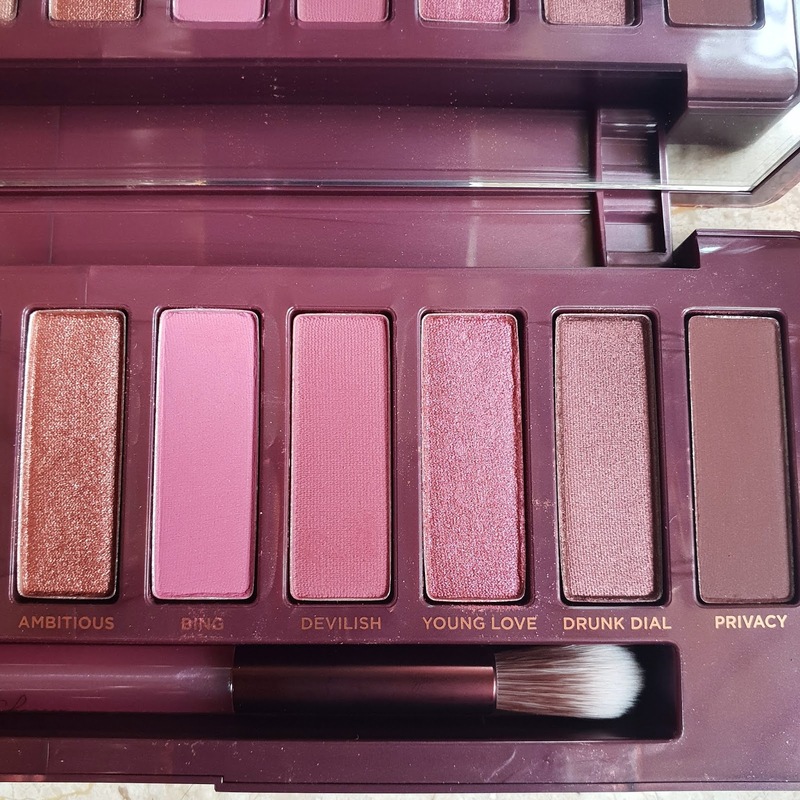 But what I loved about this palette is shade range from coral to plums its more for a fall holiday look. 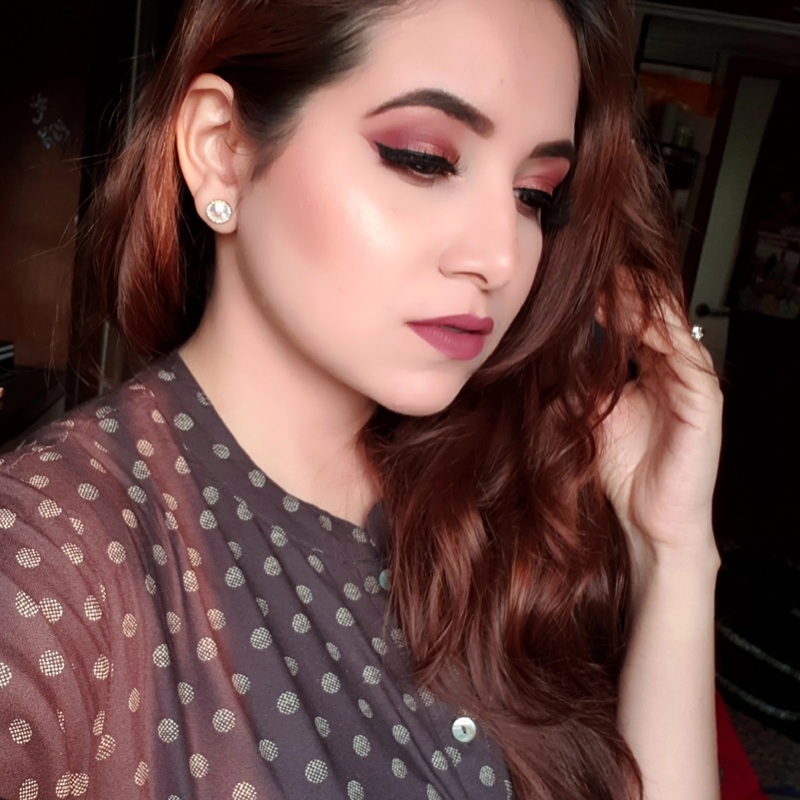 I really liked creating different looks with this shades. The matte ones are quite buildable and gives good color pay off. They stay well on with primer for 8-9 hrs without fading or creasing. You can use them on upper as well as lower eyelid. It doesn’t contain any fragrance. 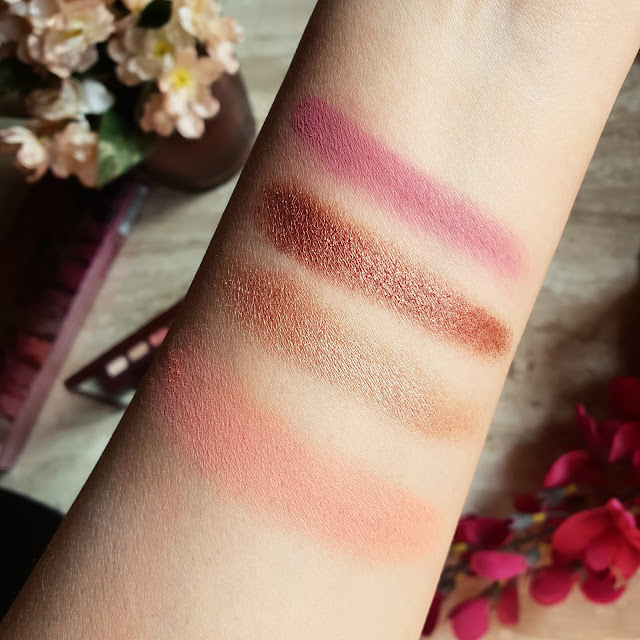 HOT SPOT it’s soft beige matte eyeshadow having warm undertone. Its highly pigmented and has powdery feel. Its easily blendable and can be used for softer matte look. CAUTION It’s a subtle peachy beige having warm undertones. Again a matte eyeshadow with good color pay off. BANG BANG it’s a shimmery peach eyeshadow more like warm coral shade having speckles of shimmer its not easily blendable and quite sheer needs to build up using a damp brush. FEELZ its a coral pink with warm undertones a matte eyeshadow with medium coverage. Do not use it without primer as it can give creasing also it starts fading in few hrs. JUICY it’s a nice coral matte eye shadow having good color pay off. Doesn’t give fall outs and gives medium opaque coverage. TURN ON one of my favourite copper shade. Its highly pigmented gives excellent color pay off. The consistency is soft and easily blends into skin. It sticks well to the lid and gives pearly sheen effect. No fallout no sheering. AMBITIOUS It’s a reddish copper with pearly sheen. The creamy consistency gives excellent color pay off. Highly pigmented and also can be applied with wet brush. DEVILISH It’s a matte reddish plum shade. It has good color pay off. Single layer doesn’t give opacity so needs to build up. YOUNG LOVE A beautiful plum shade having copper tones. It has shimmer but doesn’t look like shimmer eyeshadow when applied on lid. 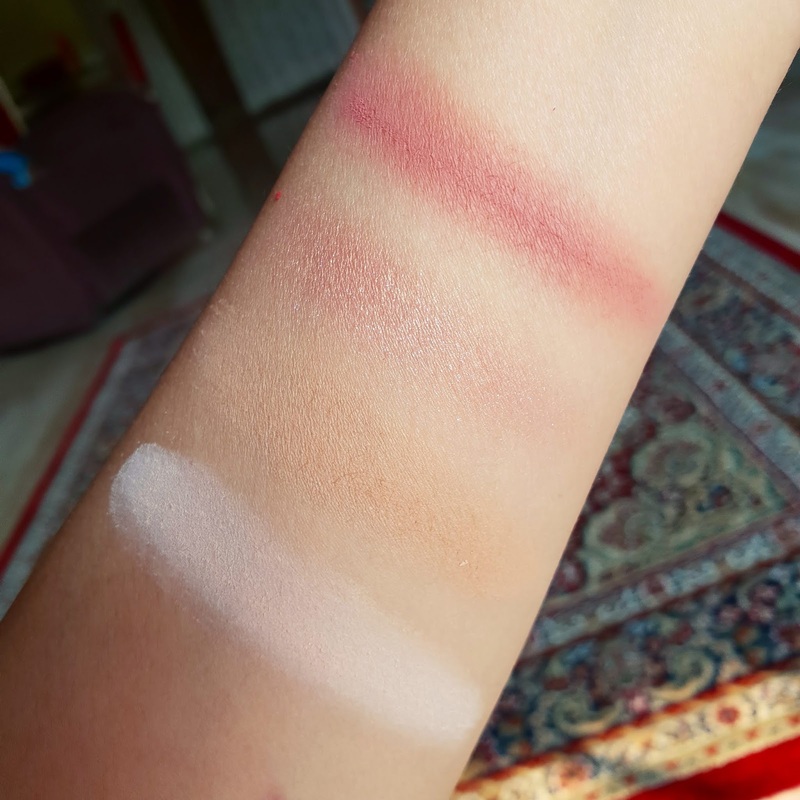 The formula is bit drier and it looks more like a semi matte eyeshadow with some sheen. 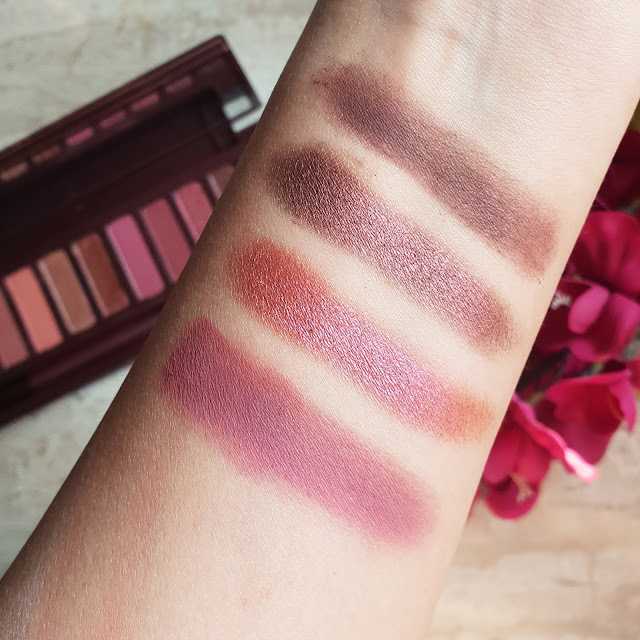 DRUM DIAL Another favorite from this palette it’s a deep plum with brown undertones. It’s has pearly sheen finish. The texture is cream and easily blendable. Excellent color payoff the formula looks thick and rich with pigments. PRIVACY it’s a deep warm brown with red undertones having matte finish. Easily blendable. Semi opaque need to build to get desired effect. The formula is bit on drier side and can look muddy if not blended properly. 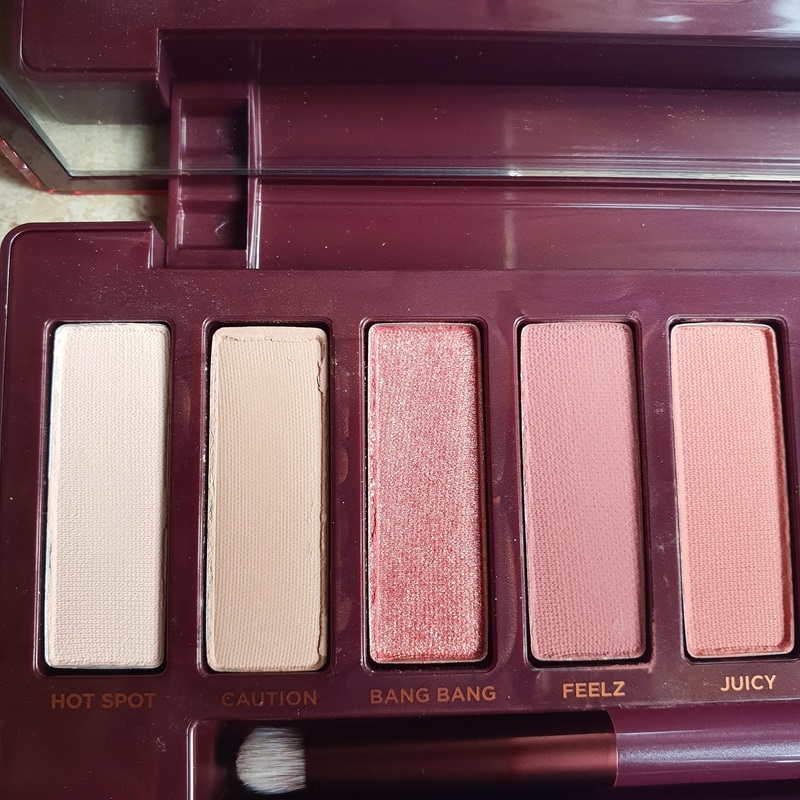 Overall some of the shades in this palette were total win for me while some of them left me totally disappointed. 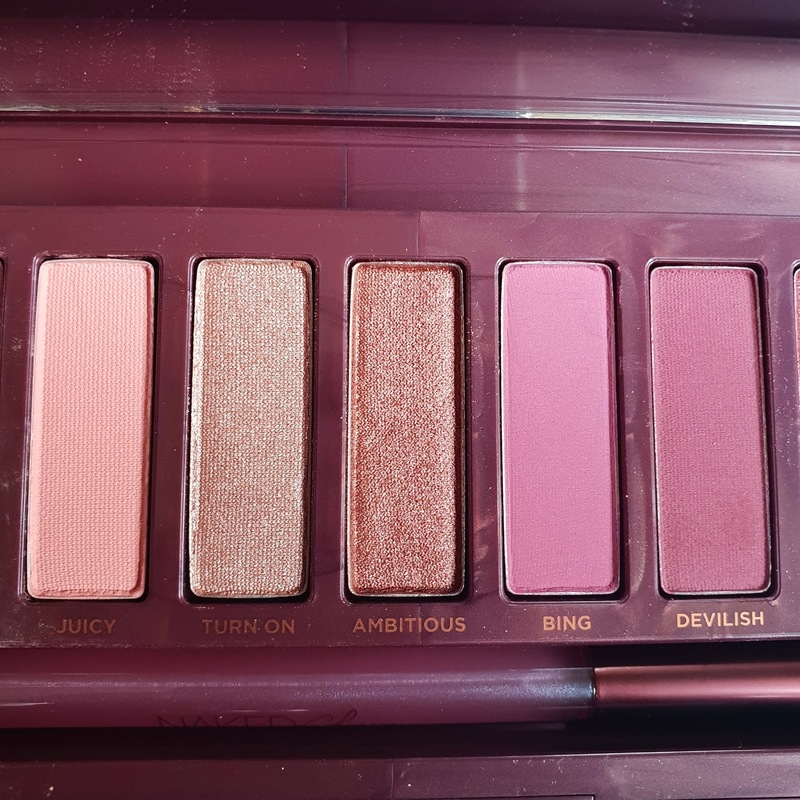 But I liked using this shades for fall look and if you want something in warm plums and corals I would definitely recommend naked palette in CHERRY.